Go West! The Canadian Rockies’ magnificent peaks span from the Interior Plains of Alberta to the Rocky Mountain Trench of British Columbia. Made of shale and limestone, and tipped with sparkling white snow, they’re so beautiful that UNESCO made them a World Heritage site. They’re also so tall, only advanced mountaineers can tackle them. But you don’t have to climb them. Rocky Mountaineer trains will wind through them while you enjoy the view. See Lake Louise, Banff and Kamloops before arriving in Vancouver. Embark on a journey of luxury and romance to Canada’s most-talked-about destinations. 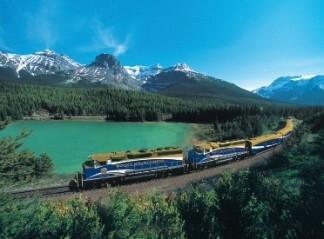 Canadian Rockies Highlights is a train adventure through Canada’s most breathtaking scenery. Note: Canadian Rockies Highlights leaves from either Calgary or Vancouver. Arrive in Calgary and spend the rest of the day sightseeing in the “The Heart of the New West” on your own. Overnight in Calgary. Depart Calgary this morning for a full-day tour concluding in Lake Louise. Journey to Kananaskis where you will enjoy a 12-minute Summit Helicopter Tour over the remarkable landscape of the Rockies. Continue on to Banff for a sightseeing tour including Bow Falls, Lake Minnewanka, Surprise Corner and the Hoodoos. A trip on the Banff Gondola is included. Overnight in Lake Louise. After lunch on your own, take a half-day tour into Yoho National Park to view some of its natural wonders. Among the attractions are the Spiral Tunnels, Emerald Lake and a natural rock bridge that spans the Kicking Horse River. At the end of the tour you will be transferred to Banff. Overnight in Banff. Travel onboard the Rocky Mountaineer from Banff to Kamloops. Highlights include the Continental Divide, the Spiral Tunnels, the Kicking Horse Canyon, Rogers Pass and Craigellachie, where the last spike of the Canadian Pacific Railway was driven. Overnight in Kamloops. Your rail adventure continues west towards Vancouver. Highlights include the steep slopes and rock sheds along the Thompson River and the rushing waters of Hell’s Gate in the Fraser Canyon. Overnight in Vancouver. Enjoy a six-hour tour of Vancouver’s spectacular North Shore. Next, visit Grouse Mountain(gondola admission included), the Peak of Vancouver, and take in breathtaking views of the city, ocean, and surrounding mountains. Overnight in Vancouver. At every service level, Rocky Mountaineer Hosts will attend to your needs. They will welcome you with a morning toast, serve up delicious meals and entertain you with interpretive storytelling. Decide which service level – GoldLeaf, SilverLeaf, or RedLeaf – is right for you. Climb aboard GoldLeaf for unparalleled comfort in our bi-level glass-domed coach. Simply luxury is the hallmark of classic RedLeaf while SilverLeaf combines the best of both worlds. Hotel partners share Rocky Mountaineer’s passion for exceptional guest service, ensuring that you, our guest, can expect a quality experience from the beginning to the end of your vacation. Hotels are based on your choice of GoldLeaf Deluxe Service, GoldLeaf Service, SilverLeaf Service, or RedLeaf Service accommodation, and you have the flexibility to change or upgrade your hotel experience as desired.Overnight stays in Calgary, Lake Louise, Banff, Kamloops, Vancouver.